As measured by the VIX, stocks have never enjoyed a less volatile year than 2017. Undoubtedly the most notable phenomenon of 2017 was the extremely smooth ride enjoyed by U.S. stocks — unprecedented, in fact. One way to measure just how smooth (or volatile) the market was is by looking at the readings of stock volatility expectations, in this case the S&P 500 Volatility Index, aka, the VIX. And based on VIX readings, 2017 was the least volatile year ever in the stock market. 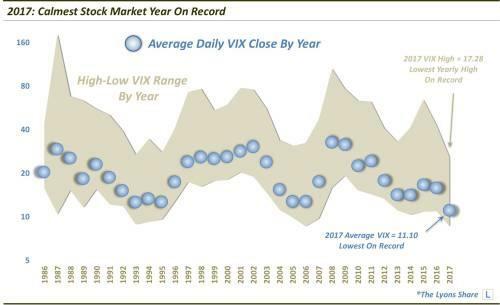 Specifically, the average daily closing price of the VIX in 2017 was 11.10 (through 12/26/17). That is the lowest of any year — by more than one and a half points — since the VIX inception in 1986 (by comparison, the “average yearly average” is over 20). Furthermore, as the chart states, the maximum level reached by the VIX in 2017 was 17.28. That is the lowest maximum level attained in any year since inception — and 60% lower than the “average yearly max”. Obviously 2017 was an extraordinary year in its lack of stock volatility. That’s interesting, but it’s also history at this point. What does it mean, if anything, for 2018? Are stocks now due for some serious volatility reversion? Well, certainly stock market bulls cannot reasonably expect the unprecedentedly smooth ride to continue forever. Volatility levels were so far below historic norms that some increase should materialize in this next year. However, there is no reason that the relative low-volatility environment cannot persist further. There is no law suggesting that an imminent spike in volatility is likely. In fact, in our view, at this point it is more likely that the low volatility will continue in the near to intermediate-term. Eventually, storm clouds will gather and the stock market seas will get choppy again. 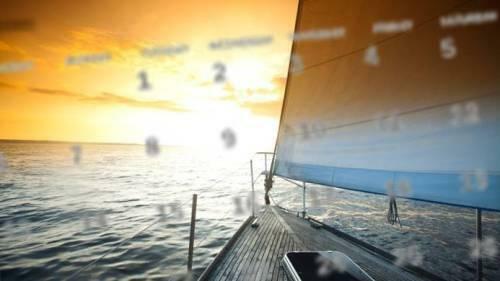 But for now, it is smooth sailing for investors.